LUCERNE, Switzerland – Two-time 100m Olympic champion Shelly-Ann Fraser-Pryce could only manage fifth in the women’s 100m at the Spitzenleichtathletik meeting in Lucerne on Monday (10). Fraser-Pryce, competing for the first time in Europe since the birth of her first child Zyon, clocked 11.22 seconds to tie with Trinidad and Tobago’s Commonwealth Games champion Michelle-Lee Ahye, who also ran the same time. Swiss star sprinter Mujinga Kambundji ran 11.12 to win the event, edging South Africa’s Carina Horn (11.13) and Jenna Prandini (11.14) of the United States in a very close finish. Another Jamaican, Jonielle Smith was seventh in 11.23. On the men’s side, Panama’s Alonso Edward completed the sprint double after he clocked 10.02 seconds to win the 100m and a new season’s best of 19.90 to take the 200m. Edward won the B race of the 100m and posted the fastest time from the two races, as American Mike Rodgers won the A race in 10.08. Jamaica’s Yohan Blake, who was second to Rodgers in the first race picked up third overall with 10.12. Kemar Bailey-Cole of Jamaica and former Jamaican sprinter Emre Zafer Barnes, now representing Turkey, both ran 10.13, while Jamaican champion Tyquendo Tracey was fifth in the A race in 10.25. Meanwhile, quarter-miler Akeem Bloomfield ran a personal best of 20.00 secs to take second in the 200m behind Edwards, while his fellow countryman Nathon Allen won the second heat in a lifetime best of 20.46secs. 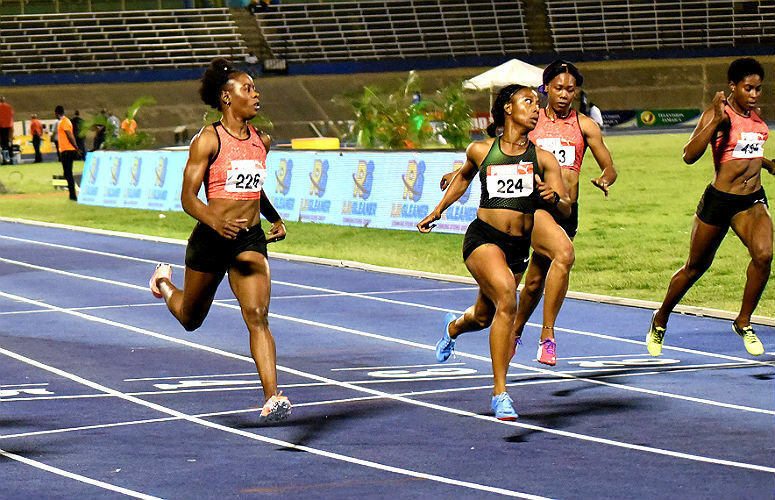 In the women’s 200m, Jamaican champion Shericka Jackson, the Commonwealth silver medallist won with 22.40, beating Kambundji (22.48) and Jamile Samuel of the Netherlands who clocked a personal best of 22.56 for third. Jamaica’s Shashalee Forbes won the B race in 22.90 ahead of her compatriot Stephenie Ann McPherson, who had a season’s best of 23.02 for second place. 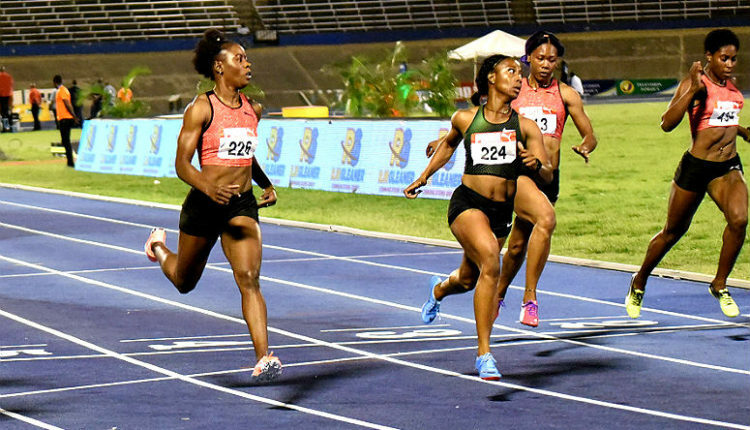 Elsewhere on the women’s side, Natoya Goule of Jamaica won the 800m in 2:00.32 after a strong sprinting finish in the final straight, her countrywoman Janieve Russell took the 400m hurdles in 53.63, while American Olympic champion Brianna McNeal blazed to a time of 12.44 to take the women’s 100m hurdles title. Kenya’s Caroline Tuigong posted 9:32.61 for victory in the 3000m steeplechase. In the field, veteran Valerie Adams of New Zealand took the women’s Shot Put with a mark of 18.67m, Algeria’s Jenny Dahlgren won the Hammer Throw with 68.12m and Christin Hussong of Germany used a third-round effort of 62.65m to secure the Javelin title. On the men’s side, USA’s Clayton Murphy stopped the clock at 1:46.41 and held off three Kenyans Alfred Kipketer (1:46.48), Cornelius Tuwei (1:46.59) and Nicholas Kipkoech (1:46.61) to win the men’s 800m. Ireland’s Thomas Barr ran a season’s best 49.10 to beat USA’s TJ Holmes (49.20) and Jamaica’s Shawn Rowe (49.27) in the men’s 400m hurdles. In other results, Henry Frayne of Australia won the long jump with 8.14m, Sean Donnelly of USA had a 75.30m personal best to take the men’s Hammer Throw, while the Javelin Throw went to Estonia’s Magnus Kirt with a mark of 85.42m.